As a nation, the U.S. takes lots of road trips, because most of the country has no viable mass transit between city pairs. If electric cars are ever to enter the mass market in North America, they have to be usable on those road trips. Last year, our reader Jay Lucas of Alexandria, Virginia, wrote an account of his road trip in a new 2017 Chevrolet Bolt EV electric car. 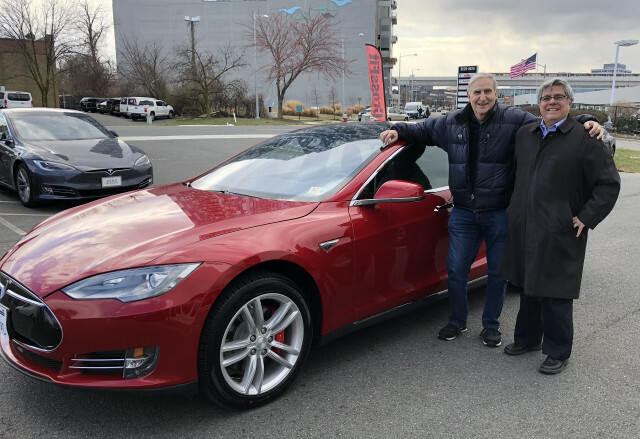 Now he's followed up with an explanation of why he now drives a used Tesla Model S. What follows are his words, lightly edited by Green Car Reports for clarity and style. I sat in a restaurant near the Supercharger beside my shiny new used 2015 red Tesla Model S, P85D, watching the electrons flow into the battery on the Tesla app and thinking how I came to be here. 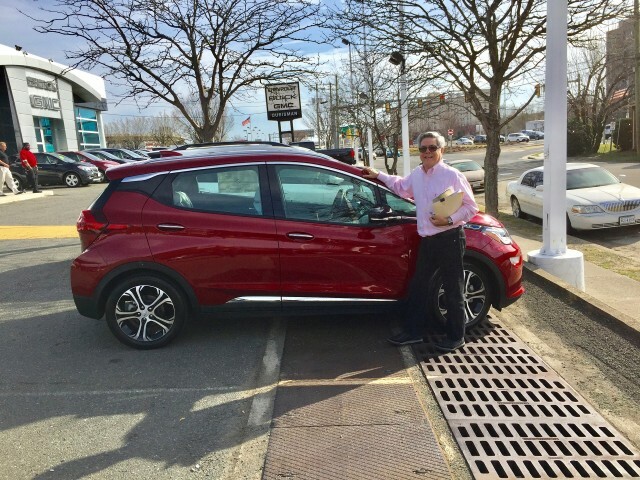 Last year I bought a 2017 Chevrolet Bolt EV, also red, and I loved it. I think it is Chevy’s supreme creation, and it carried me with spirit and verve all around Northern Virginia. But now I have a Tesla, and my son has the Bolt. I have given up some things, but boy, have I gained others. Last summer, my buddy Stewart accompanied me on a 600-mile trek in the 2017 Bolt EV. I've just completed that same journey in the Tesla with my wife. The two cars provided very different experiences: in the Bolt EV, we felt like pioneers, whereas in the Tesla, the level of worry and unknowns was far lower. That’s why I switched to Tesla—for a better long-distance trip experience. Overall, Tesla has delivered. Here are a baker’s dozen ways in which the two cars differed on road trips. Most favor the Tesla experience, but not all. (1) Finding your route is much easier with the Tesla. 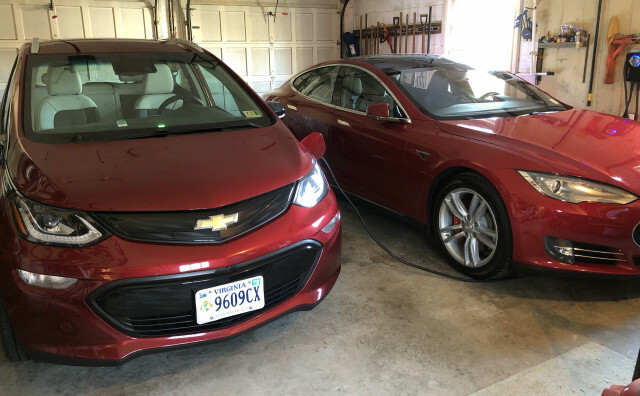 In the Bolt EV, I would spend about an hour with the PlugShare app and Apple Maps finding a route to my destination that included clusters of CCS DC fast-charging sites—and making sure the distance between chargers did not exceed my car’s range. 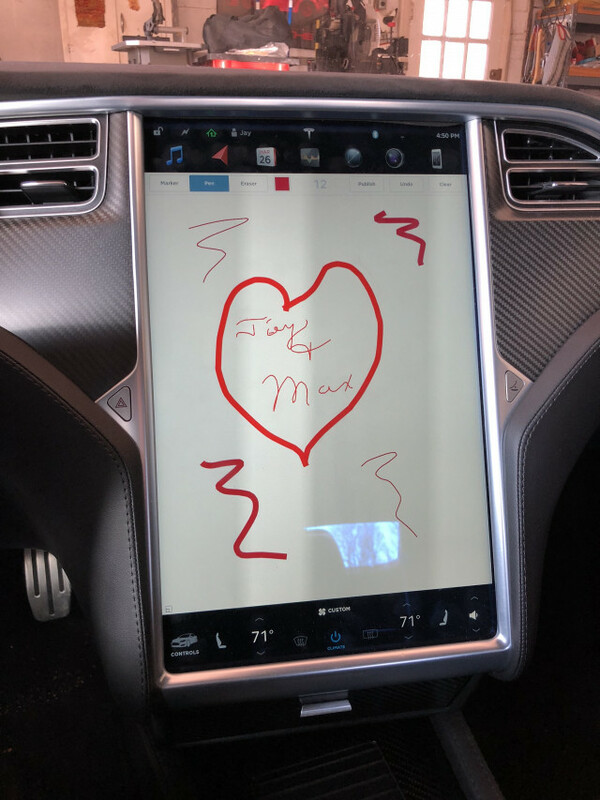 Tesla’s in-car navigation system, and its website equivalent, does the whole job for me. I simply enter the destination, and it presents a proposed route (after a short wait), along with the charging times at each Supercharger, and the predicted state of charge as I arrive at my destination. (2) Charging at a Supercharger is much faster than the CCS fast chargers for the Bolt EV. Overnight in my garage, charging speed doesn't matter. But on the highway, when I am anxious to keep going, the half-hour to 45 minutes at a Supercharger is much more satisfying than the typical hour or 90 minutes required at any 50-kilowatt (non-Tesla) fast-charging site. Many of those commercial sites stop after 30 minutes of charging, requiring a restart of the charging process, which I've always found infuriating. Some systems have now lessened this constraint, but the Tesla app on my phone just tells me when the car has sufficient charge to get me to the next charging stop with a margin of safety—and off I go. (3) The on-road charging process is automatic and hassle-free for a Tesla. While some commercial charging networks are better than others, most require some type of interactive card, credit card, or phone app to be used. With the Tesla Supercharger, I just grab the charger cord and bring it close to the Model S, the port springs open, and in goes the plug. My used Model S came with a lifetime of free Supercharging; but even if it didn't, I'd receive all charges later on, automatically logged to my account for monthly billing. (4) Traveling at speed is easier in a Tesla: less range anxiety. In the Bolt EV, 70 mph seemed to be a bright red line. Above that speed, my energy use per mile skyrocketed and range dropped noticeably. The Tesla seems to slip through the air more gracefully, and while I don't use a heavy foot, I can be freer with the accelerator. (5) Superchargers are sited better, with a greater selection of nearby restaurants and other facilities nearby. They're also closer to the highway. 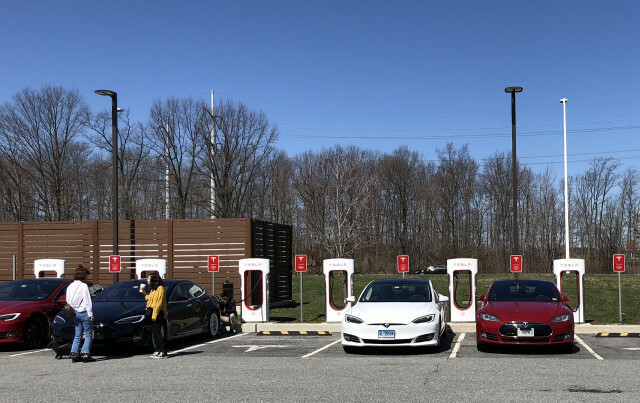 While some CCS charging stations were well-located, and more and more are appearing in highway rest stops and travel plazas, that's still the exception rather than the rule—at least along my route. The Superchargers I used seemed to be closer to the highway, so my trip was less disrupted by the charging. (6) The Bolt EV wins for route flexiblity, while the Tesla navigator program is a stubborn cuss. Once it decides on a route, it takes heaven and earth—or devious trickery—to change the Tesla's mind. If it knows about traffic conditions ahead, it keeps it carefully secret. Using Apple CarPlay in the Bolt EV as my navigation system (it also uses Android Auto), I had access to far more information about slowdowns and accidents ahead, and the system would offer to reroute me to save time. (7) Routing to charging sites was easier in the Tesla, though, because it was built into the in-car navigation system. To travel long distances in the Bolt EV, I needed to copy the addresses of the CCS charging sites I planned to use from the PlugShare app into destinations in Apple Maps. That cumbersome two-stage approach took more time than Tesla's all-in-one navigation, though it also allowed more customized route planning. (8) Tesla's live technical support is wonderful. My new used Tesla started exhibiting a ticking sound in the dashboard in the middle of a long trip to Louisville. At the next Supercharger, I phoned the Tesla help number and a pleasant lady diagnosed the problem and told me exactly how to fix it pressing certain buttons on the Tesla in a certain order. Five minutes later the ticking was gone, and 5 minutes after that, the lady called back to be sure everything was fine. Could GM's Onstar system in the Chevy Bolt EV have diagnosed a similar problem and recommended a fix? I don't know. (9) My Tesla cost a lot more as a new car than the Bolt EV did: more than $100,000 versus $43,000. But the Tesla is bigger, more luxurious, and carries almost as much as my mini-van. Still, it was twice what I had ever paid for a car, even though I bought it as a $70,000 Certified Pre-Owned vehicle. A friend noted that his Bolt EV would be worth $23,000 after this three-year lease ended; I wonder whether Teslas will hold more of their value longer. (10) I had far more music choices via Tesla's free streaming audio stations than I did on the Bolt EV. 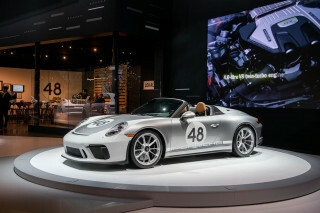 Both cars, however, include SiriusXM satellite-radio receivers, which can provide hundreds of stations for a monthly subscription fee. (11) Range anxiety was lower for me in the Tesla compared to the Bolt EV. California may have near-pervasive fast-charging sites, but the rest of the country doesn't. Having so many Supercharger stations along major highways relieved my worry about not having gas stations every few miles. I may still linger at a Supercharger past what Tesla's navigation advises, to charge my battery a bit more than the minimum necessary, but I love coasting into my destination with 40 miles extra. (12) Cold-weather performance seemed better in the Tesla. On a day last year with temperatures in the 20s (degrees F), my Bolt EV's fully charged range was down from the usual 240 miles to 165 miles showing. A comparable decline in the Tesla, from 243 miles to 220 miles, was far more tolerable. 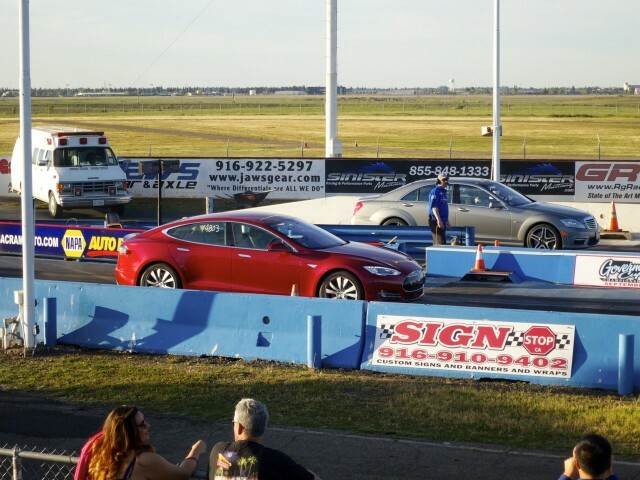 (13) Tesla has world-class acceleration, at least in its "P" performance models. My Bolt EV was spunky off the line, but on a recent trip in the Tesla, I had to pass some fully loaded gravel trucks on a winding two-lane mountain road with a very limited passing zone. The Tesla shot me past the trucks well before the dotted line became solid, far faster than I had imagined. In the end, my purpose in writing this is not in any way to dump on the Chevy Bolt EV. It is a really good car if you’re not doing long-distance trips. But I do have to make long-distance trips, and I want to do it in a battery-electric vehicle. I often travel the 610 miles from Alexandria, Virginia, to Louisville, Kentucky. Now, I have perhaps the only car that is appropriate for the job, with a little whimsy to spare. 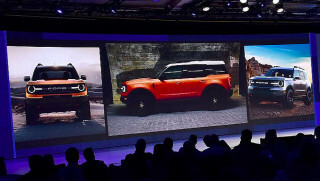 Of course, a 400-mile battery would be nice ….